Why do I love Dublin? Or is it the Dublin way? June 16th is unique in literature in that it actually has a day named after it. 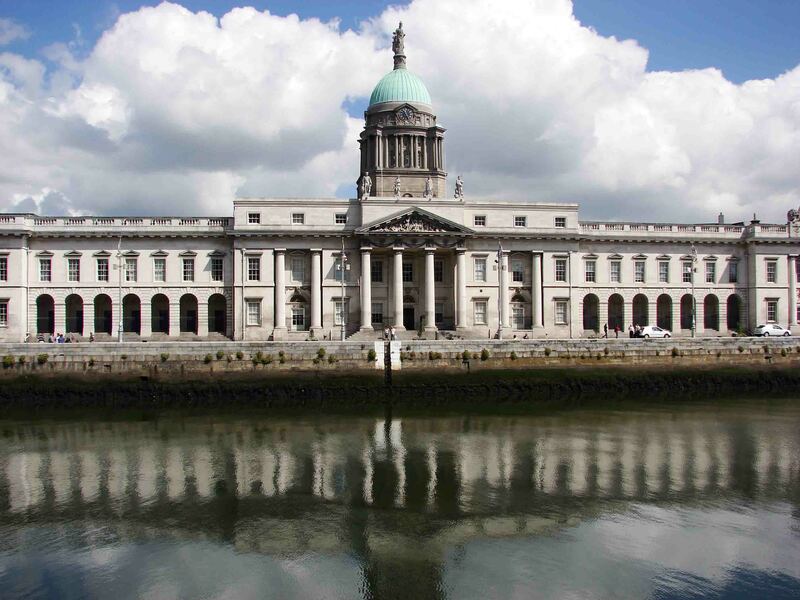 Now known the world over as Bloomsday, it is named after the main character Leopold Bloom in James Joyce’s most famous work Ulysses. And the date was deliberately chosen by the author as it was on this day in 1904 that he and Nora Barnacle, his future lover and wife, went on their first date. By the following October she would leave Dublin and accompany him to France, where they struggled for many years until his eventual breakthrough and international recognition. Stately, plumb Buck Mulligan came from the stairhead, bearing a bowl of lather on which a mirror and a razor lay crossed. The tower was one of many erected along the coast in preparation for an invasion by Napoleon’s forces. However, after Admiral Horatio Nelson (he of Nelson’s Pillar fame) defeated the French navy at the Battle of Trafalgar on the 21st October 1805, the threat was extinguished. Many of the towers were subsequently sold off while others were left unattended and remain derelict to this day. 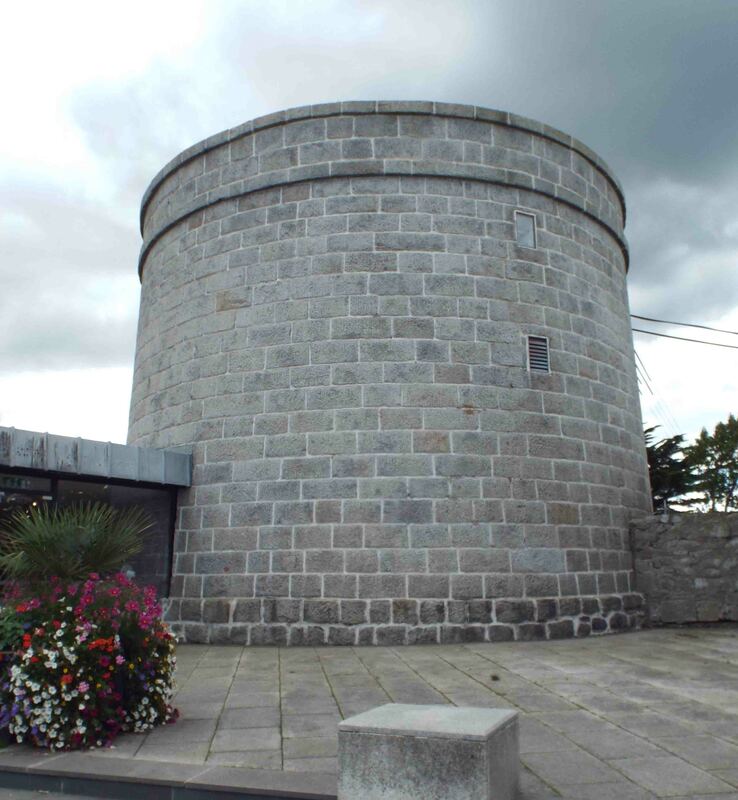 The tower at Sandycove was maintained in good condition when Gogarty rented it in the early summer of 1904. 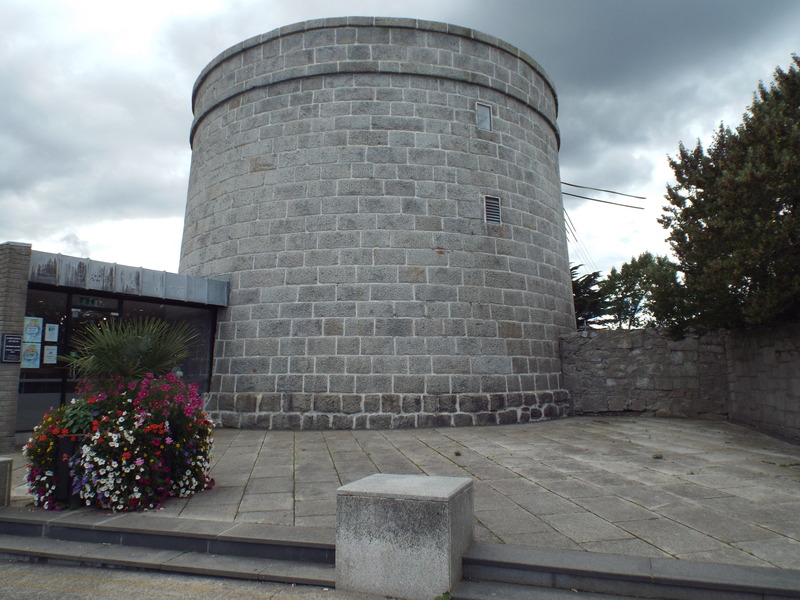 Today, it houses the James Joyce Tower & Museum which is a ‘must-see’ for all Joycean fans and those interested in literary history. 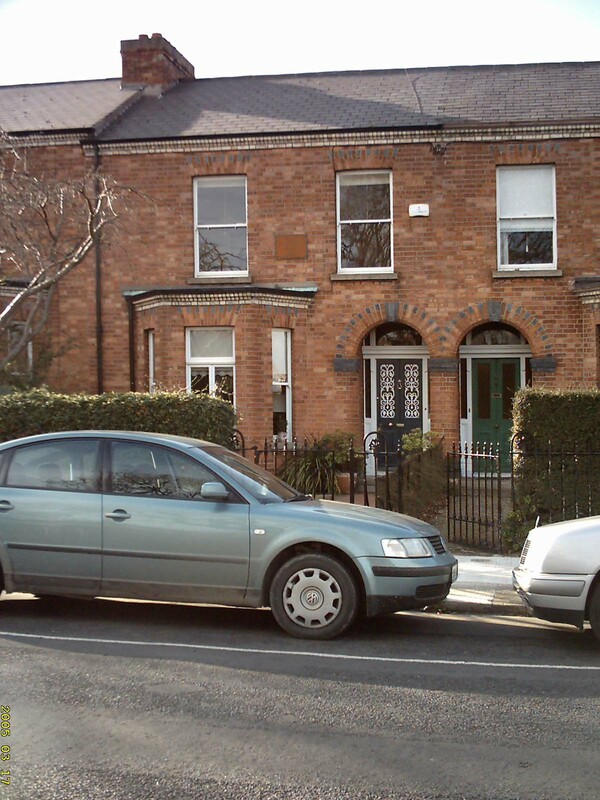 There is a fabulous collection of items, including; an original copy of Ulysses, many of Joyce’s notebooks and a vinyl recording of his voice! 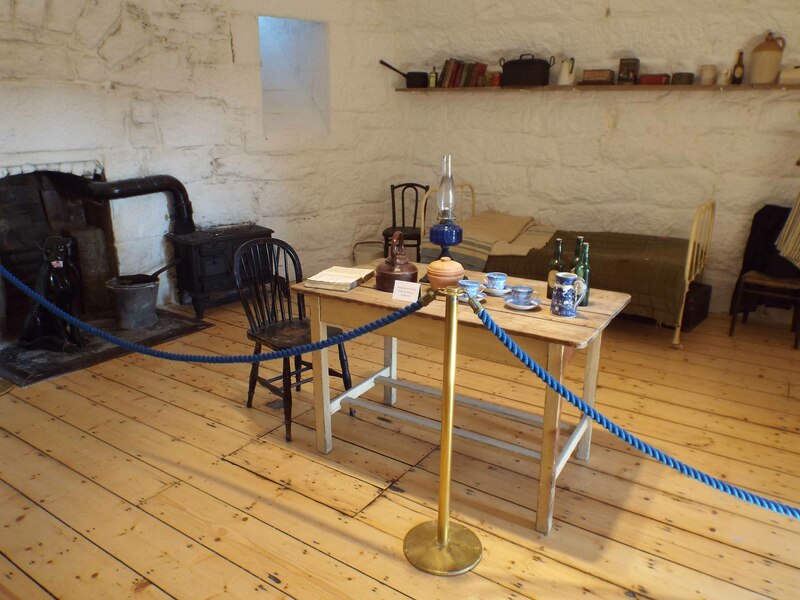 Up the narrow stairs the space has been remodelled with table, chairs and various contemporaneous items showing the living space as Gogarty and Joyce would have known it. 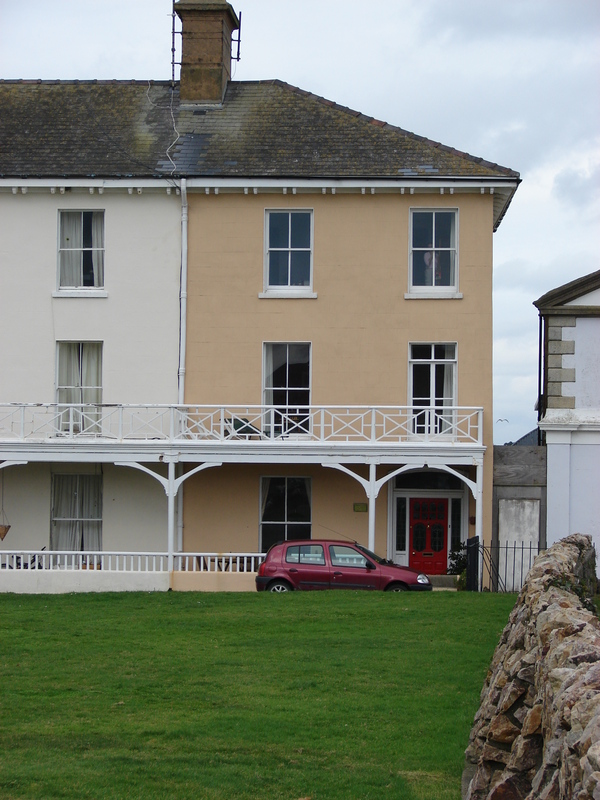 Outside, there is Joyce’s death mask and a guitar that he was fond of playing. Up the last flight of steps to the roof (from the stairhead..) you have the wonderful panorama of Dublin Bay, the coast northwards to Dublin City, leading you around to the mountains to the south-west. On a clear day it is spectacular and, not surprisingly, very popular with photographers. 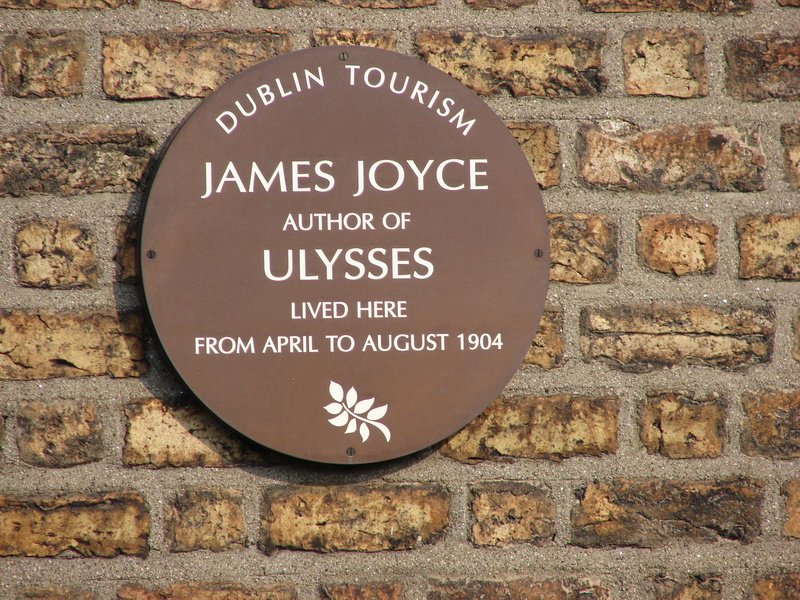 Celebrating Bloomsday has become big business and events are now held in many cities around the world that have Joyce’s works to an ever increasing audience. 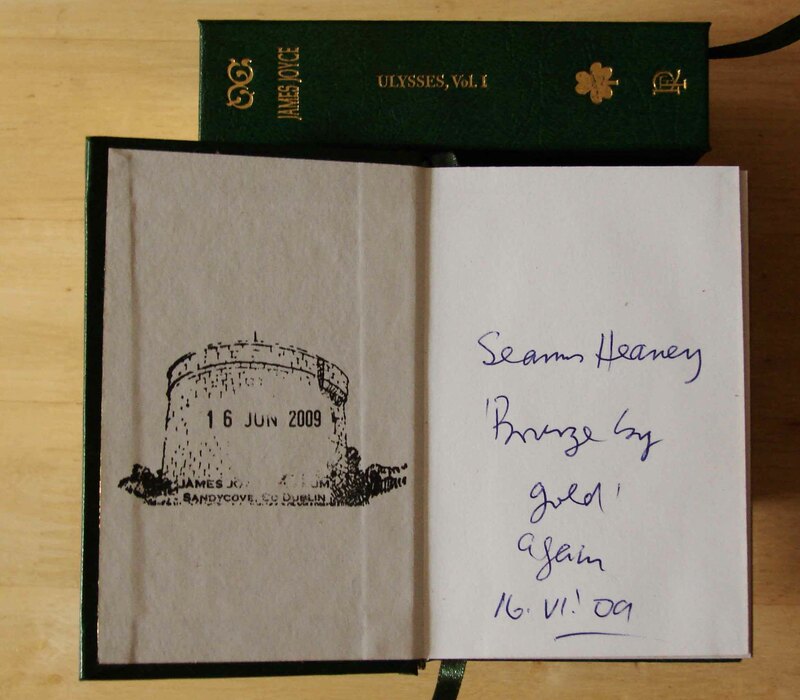 However, the first Bloomsday celebrations on it’s 50th anniversary in 1954 (see short silent clip below) were rather prosaic by today’s standards, and involved a number of Dublin’s literati and two horse-drawn carriages. 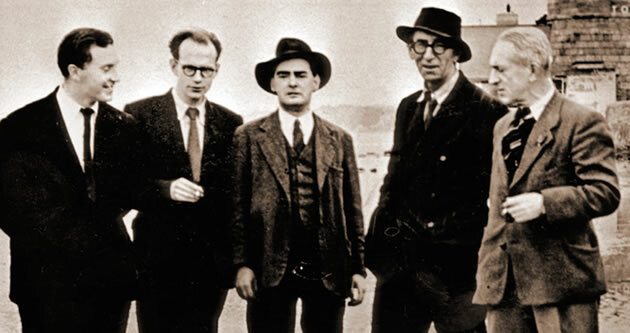 The group: John Ryan (owner of The Bailey pub and founder of Envoy art magazine), Flann O’Brien, Anthony Cronin, Patrick Kavanagh, Tom Joyce (a cousin) and AJ Leventhal (Registrar of Trinity College) had planned a ‘pilgrimage’ along the circuitous route set out in the book. 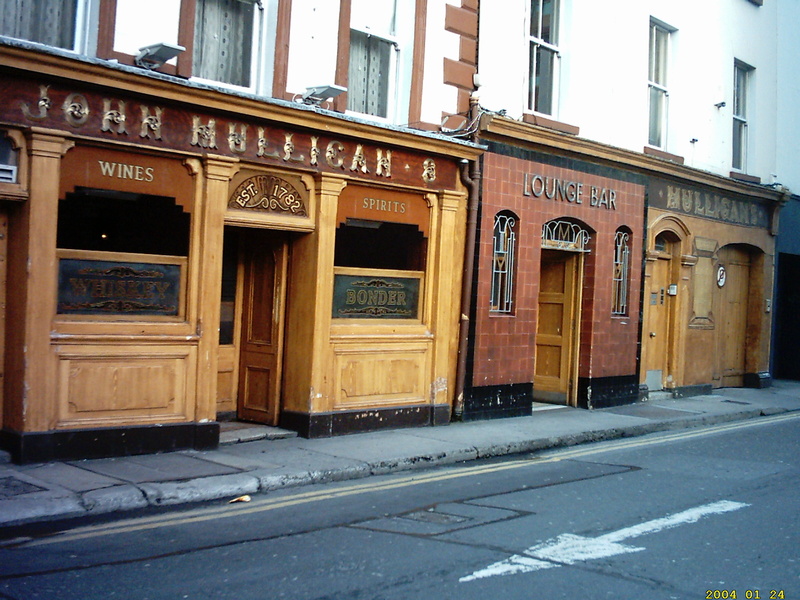 However, after a number of stops for ‘refreshments’ the adventure was abandoned due to ‘inebriation and rancour’ and they retired wistfully to The Bailey (on Duke Street). You may very well see some horse-drawn carriages on the big day but as to whether they will be ferrying such an illustrious group, well, I guess that you will just have to wait and see – and then you may have an interesting story to tell. 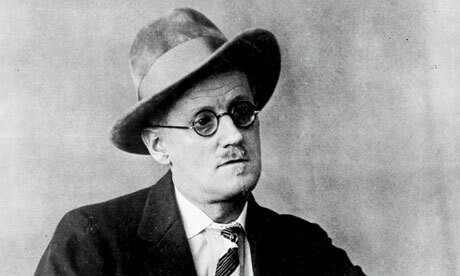 Happy Bloomsday! 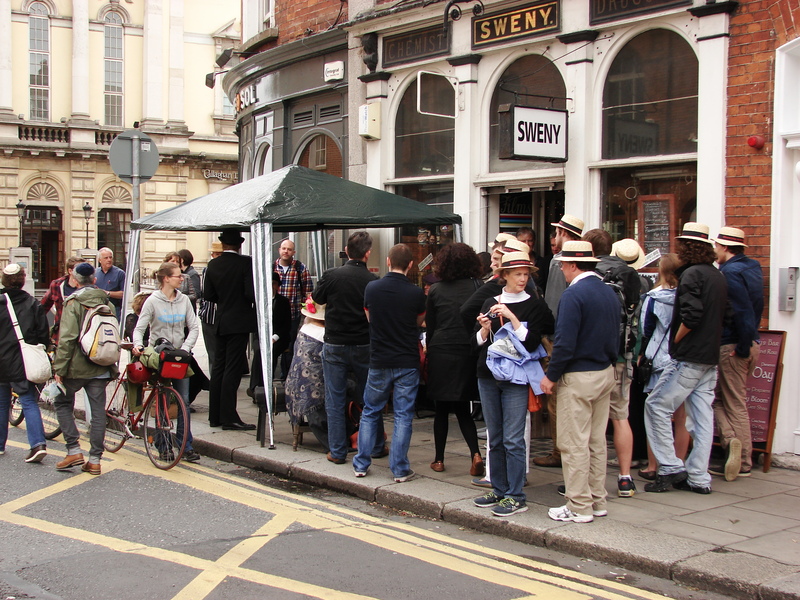 Sweny’s – A final Bloomsday? Joyce – weighing things up…. 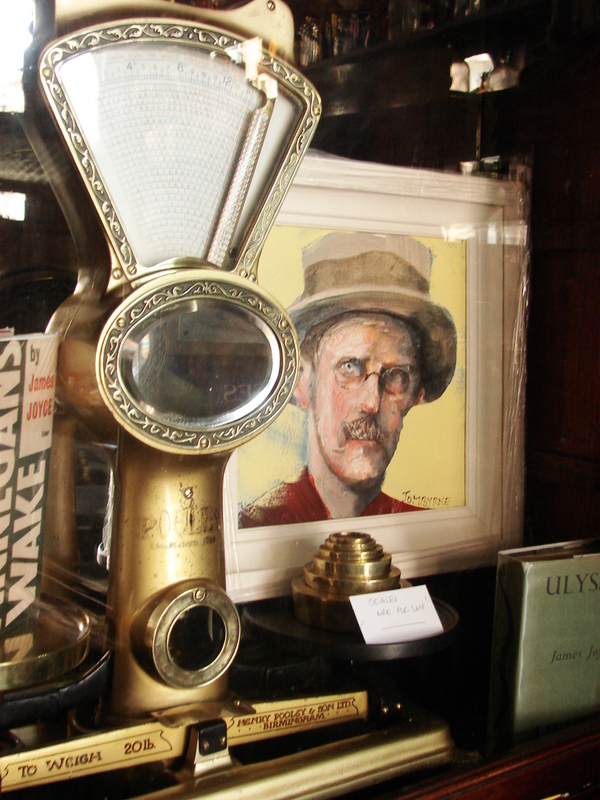 It’s that time of the year again when the bespectacled figure of James Joyce appears in many shop windows as fans and visitors celebrate Bloomsday on 16th June. 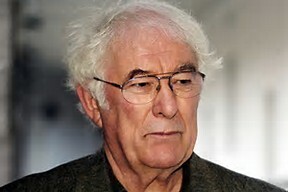 Interest in the great man’s work has increased in recent years, and there is now a weeklong programme of events that caters for all interests. On an international scale, celebrations are now held in many major cities, which eventually lead to more tourist interest and the growing opportunities for local actors, writers, musicians to play a part. And, as this year is the 100th anniversary of Joyce’s collection of short stories Dubliners there is any amount of events to attend. 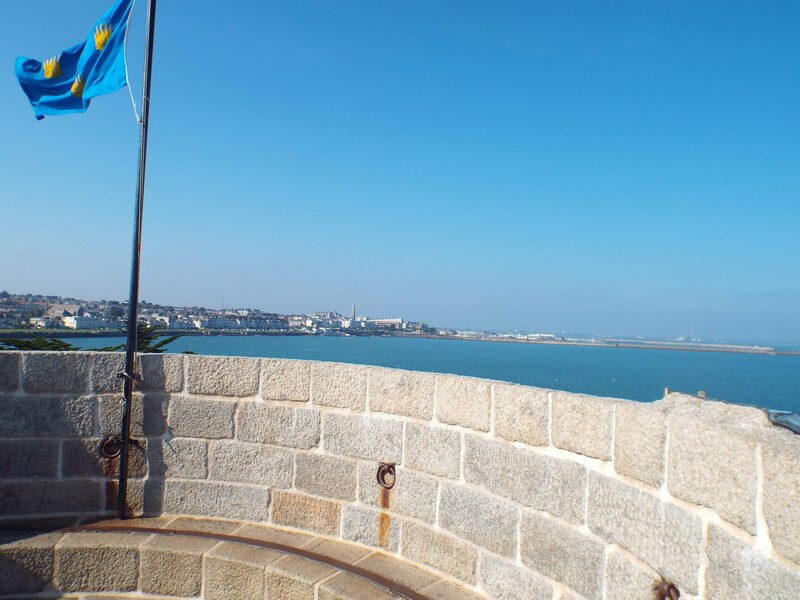 The big day begins at the Martello Tower in Sandycove and continues in many different venues until late. Traditional breakfasts will be served in Caviston’s and Davy Byrne’s, and readings from the book can be heard during walking tours. Many people will be dressed in Edwardian period clothes that adds to the colourful atmosphere. Around the town there is plenty to do with plays, films, sketches, street theatre and much singing to enjoy. But for one group of volunteers this Bloomsday may be their last. 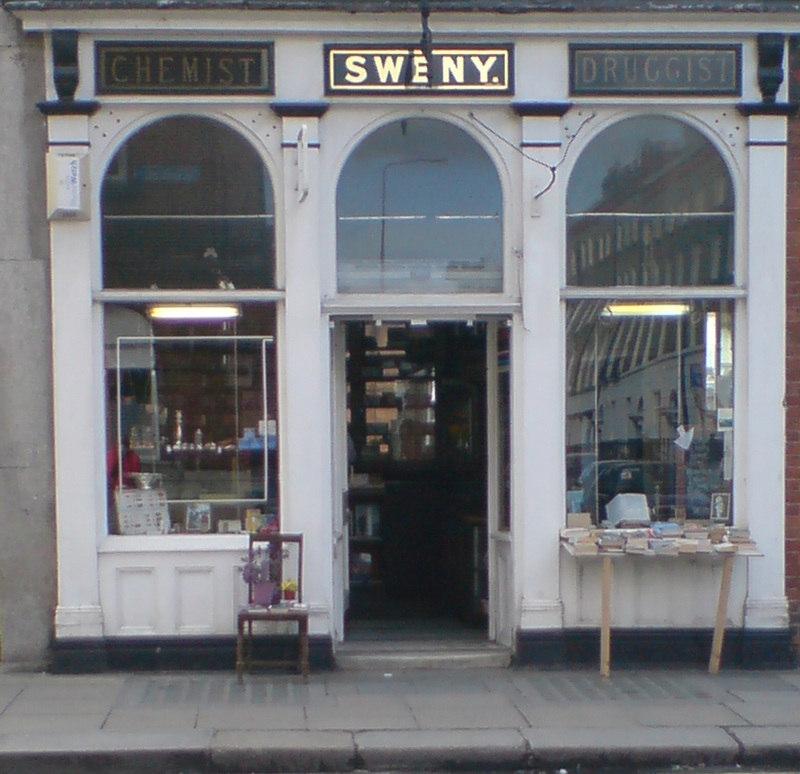 They have maintained Sweny’s Pharmacy (Lincoln Place) for a number of years, but the future looks uncertain. 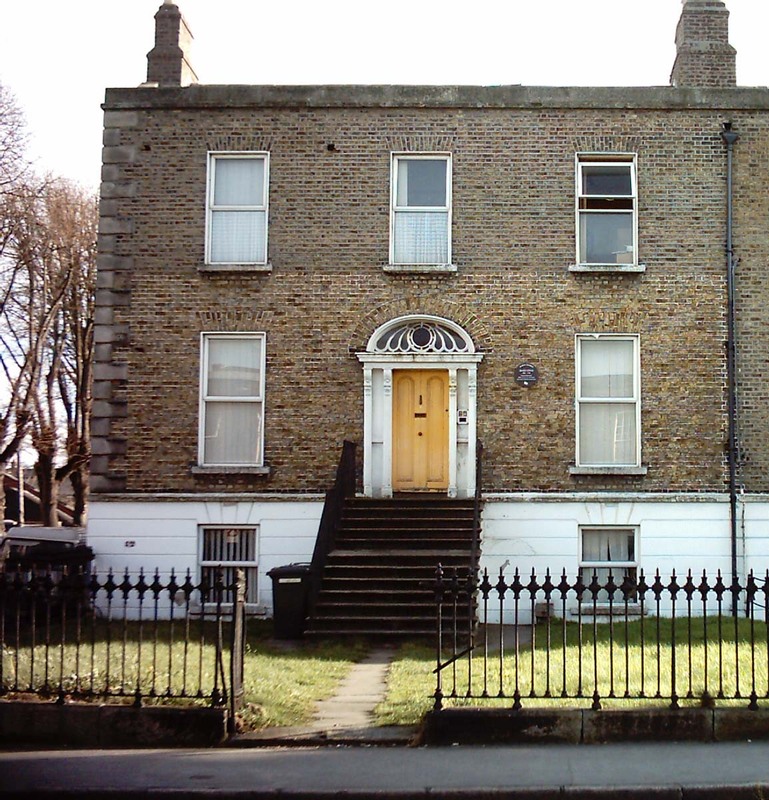 The shop, which dates from 1847, was made famous by James Joyce in his book Ulysses. 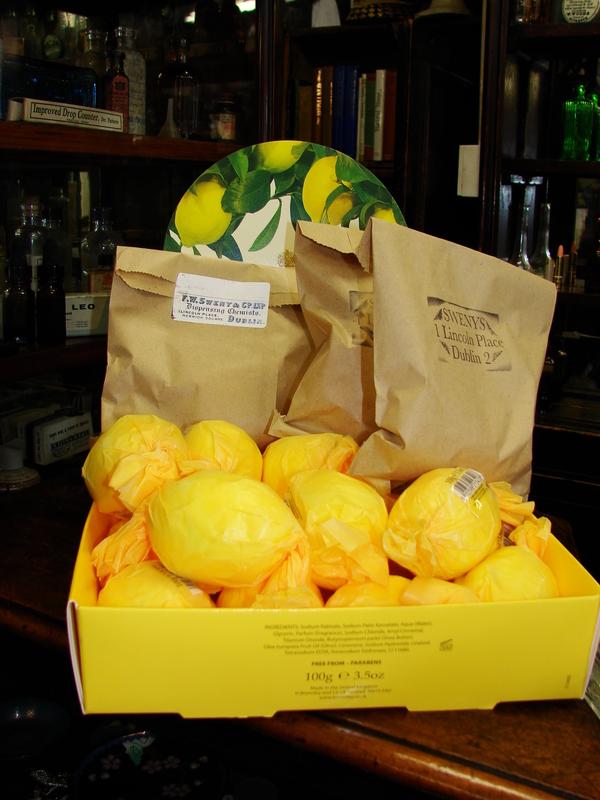 In the story, Leopold Bloom steps inside and buys a bar of lemon soap and carries it with him for the rest of the day – a lucky talisman. Amazingly, the shop is just as it was in Joyce’s day, an instant reminder of a different time and a living connection to one of the greatest books ever written. Sadly, the shop, a literary, historical and cultural landmark may be forced to close due to the imposition of commercial rates. I wonder what Joyce would have to say! SOS – Save Old Sweny’s.